Dani Fuller at AmaDablam High Camp. Heather models the safety equipment on her harness (Photo Heather Jennings). Climbing on Island Peak. Photo Emil Friis. We offer a special 10% professional discount for mountain guides. Experience the elite world of mountain climbing leadership, and learn how to become a top-notch expedition leader during the course of a high altitude expedition. This is very exciting "on the job training" where you will learn critical skills essential for team safety and success in the high peaks, not a dry dusty boring theoretical classroom exercise. 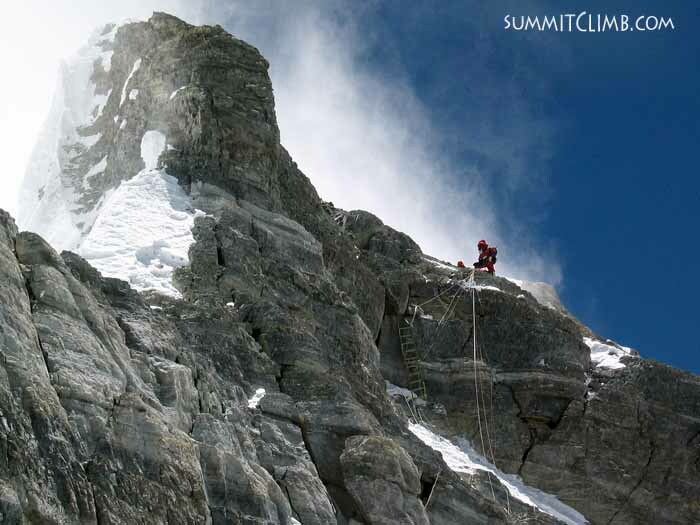 Pursue a career on the most beautiful summits of our world. Join one of our well organized teams and take on a higher level of responsibility, in return for a lower price and free basic hotels. 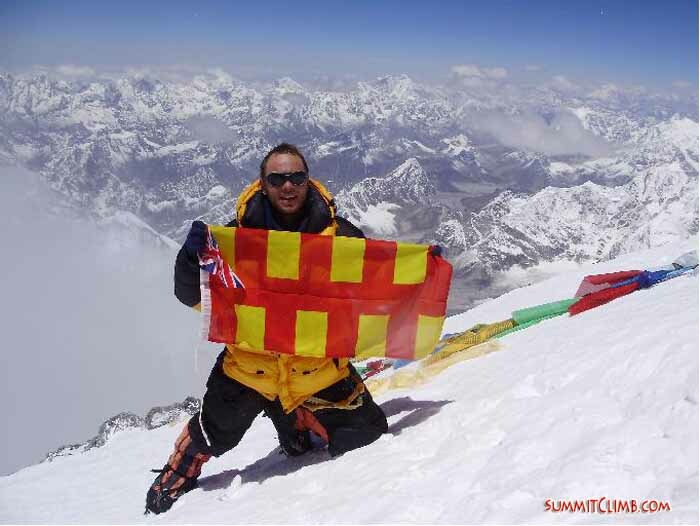 Add a credential to your CV: "I am a successful graduate of SummitClimb's Leader In Training Programme, where I acted as an Assistant Expedition Leader on Mount Everest (or one of our more than 15 expeditions)." SummitClimb and The Mountain Climbing Community need good climbing leaders. In order to fill this gap and provide a good service to the climbing community, SummitClimb has developed the Leader-in-Training Programme (LITP) beginning in 2001. All of SummitClimb's leaders are graduates of this programme and many Leader in training graduates have found employment throughout the climbing and outdoor pursuits industry. The LITP is open to individuals and groups to participate in any of the mountain expedition climbs offered by SummitClimb.com. Thank you for joining our team. 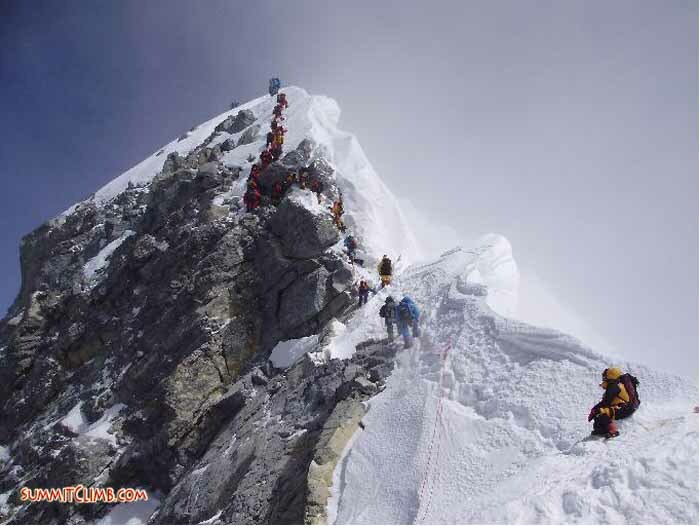 The famous Hillary Step on the south side of Mt Everest. Richard Pattison on the summit of Mt. Everest (Richard Pattison). You may be interested to participate in our Leader Training Programme, which is designed for people who are interested in becoming a mountain leadership professional, or who are already. The leader training course provides you with a 10% discount and free basic hotels in Kathmandu. Please note that normally our leaders are full-service members. In return we ask that you arrive a few days early and leave a few days later than the main expedition, in order to assist with organizational logistics before and after the climb. In addition, we will definitely be calling on you to perform in a leadership role during the climb, and on the mountain itself. Team on the north summit of Shishapangma. Clockwise from foreground: Jangbu, Gyelzen, Karten, Alejandro, Haris, Bart, and Richard. Team working their way past the gendarme (Dan Mazur). 1. Meeting our SummitClimb staff, expedition leaders, climbing sherpas and kitchen staff, office personnel. 2. Participate in expedition planning and task scheduling meetings. 3. Helping members transfer from the airport to their hotels, making sure they are settled in. 4. Welcoming members to group functions, helping them feel like a part of the team. 5. Learning about and checking team member's equipment and taking them shopping and helping them find good values at Kathmandu's one hundred mountain equipment shops. 6. Learning about, checking and packing group equipment. 7. Learning about, checking and preparing safety equipment, technical equipment, and high altitude medicines. 8. Assisting in transport logistics and packing for flights to Lukla, and bus rides to Tibet. 9. Assisting members, staff and team during Lukla airport flights and Tibet Border crossings. 10. Learning about and helping with logistics during trek to basecamp, including monitoring yaks, porters, teahouses, hotels, jeeps, etcetera. 11. Ensuring members are comfortable and acclimatizing correctly and staying healthy during the trek. 12. Being of assistance in establishing and setting up basecamp. 13. Helping in setting up pre-climb training sessions in and around basecamp, including rope fixing, checking anchors, setting up belay and rappel systems. 14. Reviewing members' technical equipment, shoes and clothing and climbing techniques during pre-climb training sessions. 15. Helping establish safe and comfortable camps at all elevations on the mountain. 16. Assisting with checking the route, ropes, and anchors during the climb. 17. 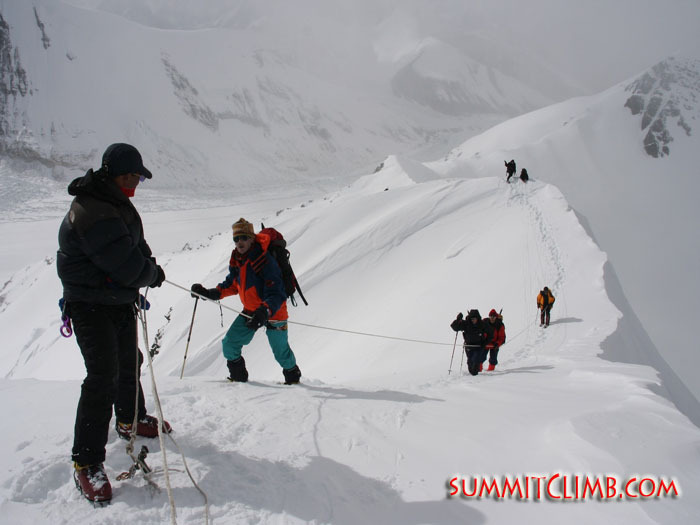 Ensuring that members are comfortable and safe during the climb, that they are acclimatizing well, staying well hydrated, eating and sleeping correctly in all of the camps on the mountain, and climbing and descending in all safety. 18. 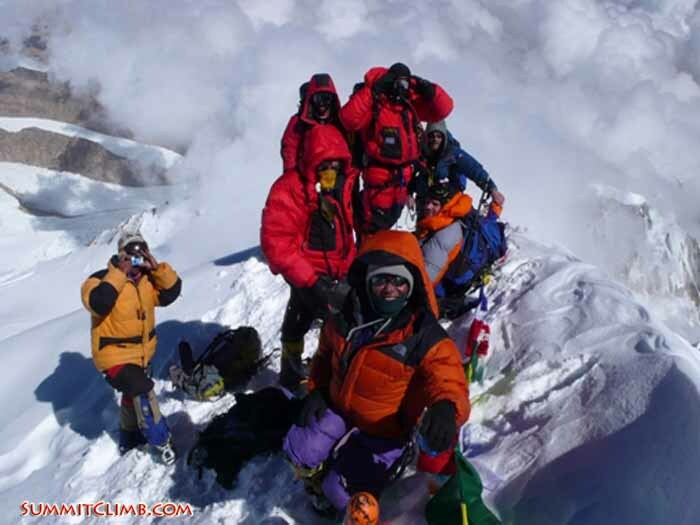 Being available to assist the leader and climbing sherpas during the climb, especially in the event that the expedition leader and sherpas need to perform a rescue. 19. 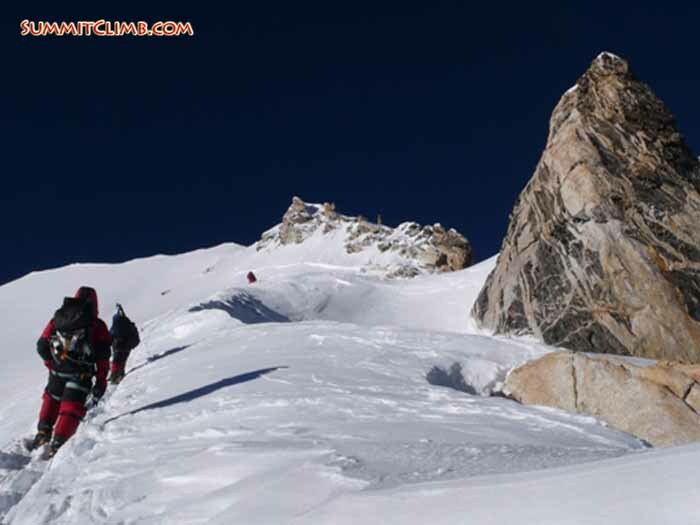 Helping members, leader, and sherpas attain the summit safely and descend carefully. 20. Assisting with the packing up of camps and removal of equipment and rubbish from the mountain. 21. Helping everyone retrace their steps and have an enjoyable and safe trek out and return journey to Kathmandu. 22. Once back in Kathmandu, being a part of the team and enjoying one another's company. 23. Unpacking, drying, sorting and correctly storing equipment and supplies for the next expedition. Compiling lists of what needs to be repaired, replaced, etcetera. a. Be a good friend and climbing partner for everyone on the team, all members and staff. b. Communicate well and strive hard to make everyone feel at home. 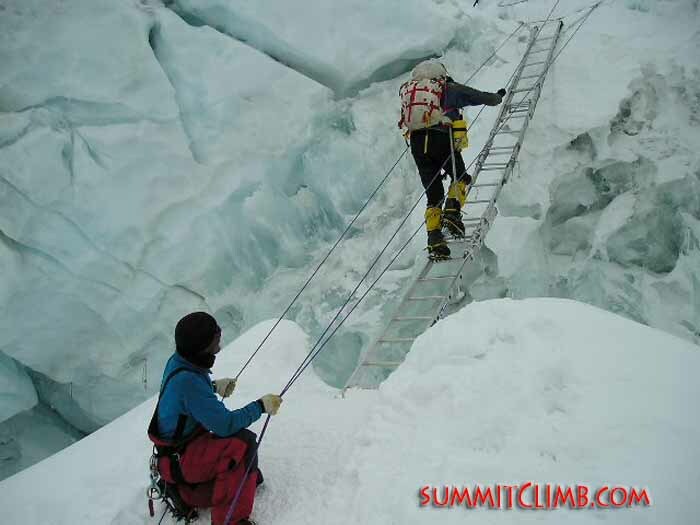 c. You will be asked to take photographs, videos, and write stories about your experiences during the climb. These will appear on SummitClimb's websites. Do you think the above represent a lot of duties? Are you concerned you might not know how to do everything, and be unfamiliar with what is involved? No worries, you can learn all of this during the expedition and our leaders and staff are very adept at teaching, instructing, and helping you learn all of the necessary skills. Annette and Lhotse summiter Herman Kristen (the first Dutchman to summit Mt. Lhotse in 2008), near the summit of Lhakpa Ri (Peter Hage). Dawa Sherpa assisting Ken Stalter across a crevasse on the North Col (Dan Mazur). Are you interested in becoming a leader-in-training? 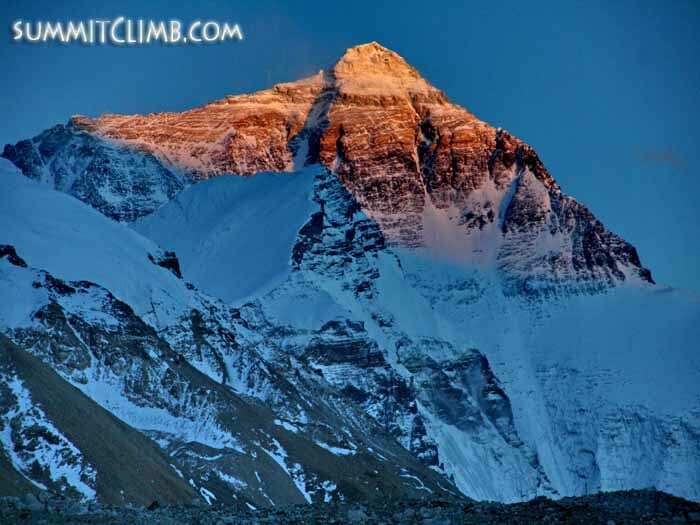 If so, please contact us at info@SummitClimb.com . Could you please tell us a bit more about your previous mountain leadership experience, the highest altitude you’ve reached, how you felt, and what motivates you to join our team as a leader-in-training? Thank you. All of our current expedition leaders began their career in our leader-in-training programme. Please visit our leadership site to see what trips they lead for us and how they got their start: Leader Site. A beautiful sunrise cresting over the summit of Everest (Tunc Findik). A view of the famous second step on the north side of Mt. Everest (Franck Pitula).